I've been reading some fairly heavy material lately, Cormic McCarthy, George Orwell, Raymond Carver, and Joseph Conrad. I turned dark and morbid, remolding my aesthetics to reflect the remolding ethics that are undergoing constant fluxing and flexing. I didn’t have a positive perception of existence, and was seeking something to help twist a U-turn, and bring me back to ignorantly blissful optimism. It was time to open the pages of something lighter, easier, and more rewarding. I considered Vonnegut, but decided to pass when I was overtaken by a landslide of color filled pages of Bill Watterson’s life work in an assortment of 4 books. It was clearly an answer from something possessing more power than I could ever fathom. I obliged, self-sacrificing my induction for the blabbering and contemplating quandaries of Calvin and Hobbes. And all that there was to discover was something omnipotent enough to bleach out the floundering effects of the pessimistic. I started reading Calvin and Hobbes when I was 12. The appeal was the similarity to being a little kid with an untamed imagination that took control of reality. I always grabbed the irony of Hobbes becoming animated only in front of Calvin, and then becoming a stuffed tiger in front of everyone else. I recognized the cliche of pretending that the older teacher was really a deformed space creature, trolling over the surface of a distant planet, attempting to induce innocent bystanders to the doctrines of mathematical unfulfillment. It was comfortably clad to see that filthy Susie Derkins get pummeled and pelted with Calvin's assault of snow balls and water balloons, for the international offensive crime of being a girl. And some of the most enjoyable scenerios were the snow men community, and all of their tribulations and assemblies, inclined from their personified cultures, scaling from global warming to induced poison. But, as an adolescent, I wasn't able to pick up the more meaningful affects that were outlined inside of this playful pietry dish. There's philosphy, politics, religion, and subjective meditation. Which make these comic strips similiar to any of the other literary loaded publications, except that these are all spoken through the insight of a 6 year old boy. Although, only 6, this certainly is the most mentally liberated to handle the grand and deep pondering behind all of these heavily debated topics. There are moments where Calvin questions eternity and life after death, only to have Hobbes immediately redirect the focus to whatever hazardous activity they may be engaged with. Calvin uprises with demands for democracy and freedom within his own household, seeking to earn a respected voice from the totalitarian rule of common knowledge! And Calvin attempts social reform with integrated rule and order, all devised from persistent pondering and frequent reflective gabbing. 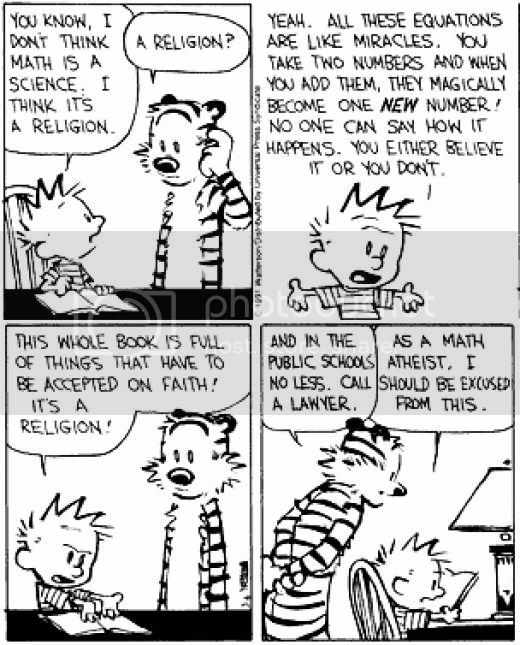 What’s most rewarding through the insight of Calvin, is that he’s still only 6 years old (with the help of Hobbes' comic relief). The reader can always reflect on his deep insight and mental prowess, and ultimately conclude that these insights are the distribution of a 6 year old boy with a talking stuffed tiger. The comic rounds up the same conclussions of all great literature that is birth from the most respected thinkers, writers, analyzers, and contemplaters, and filters these conclussions through the opinionated flesh mold of Calvin, the boy who’s still growing up, and too inexperience to completely understand everything that he wishes to claim that he does, something that can be related to the authors of the morbid conclusions from the dark side of expressive writing. Hidden behind the Pulitzer Prizes, the national recognizition, and the permanent acceptance in the heralded literary community, these poets, writers, and expressive thinkers are none more than flesh-molds of human beings who impose their own opinionated conclussions towards the masses. All of which I someday desire to become. But, the degree of intelligence embedded within the brush strokes and subtle conversations within Calvin and Hobbes provide for an honorable read, and certainly worthy of any adult's attention.